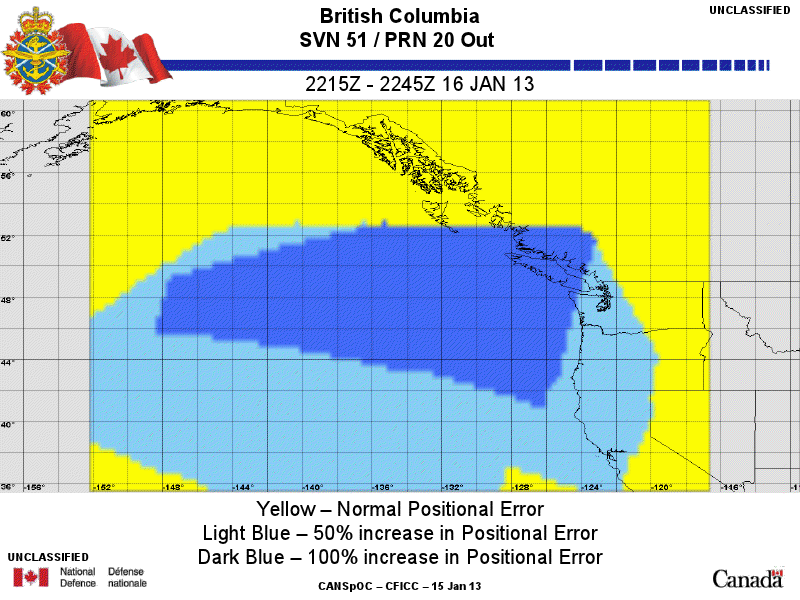 In awesome space news, SAR Teams throughout southwestern BC were notified today that a known GPS dilution of error event will occur tomorrow (January 16th) between 2215Z and 2245Z. Converting Zulu (UTC) to normal time means that’s from 14:15 (2:15 PM) and 14:45 (2:45 PM), a 30 minute window. What this means is that while your GPS will still display a coordinate, the error could be two to three times as big. If you’re interested in my analysis of GPS error, read “Your GPS is lying to you” and “How to calculate your own GPS accuracy” and note that during this period you should double or triple the distance the GPS reports. The Canadian Space Operations Cell (CANSpOC) has been notified of a GPS Dilution of Accuracy that will impact Canada. Between 2215Z 16 JAN 13 and 2245Z 16 JAN 13 in the area defined in the attached graphic, GPS accuracy will be diluted by at least half. In short, any GPS receiver’s error rate will at least double. and in some cases triple. 1) I had no idea we had an agency called CANSpOC. 2) Who notified them? The GPS system is still an American military asset, right? 3) What’s causing this? Is Commander Hadfield repairing a satellite? ‹ Are GoPro Cameras correlated with accidents? is there a link to see the impact map for other parts of Canada ie Ottawa?? 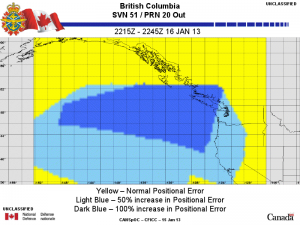 Only the shaded areas near the coast of BC are affected. Rest of Canada GPS will function normally. In the Cowichan Valley, mine was as accurate as always. However my assistants put her 2km across town. 1 Pings/Trackbacks for "GPS Dilution of Error Notice"